Feature driven content with integrated multimedia, delivered directly to the subscriber’s email, working across desktop and all mobile devices. 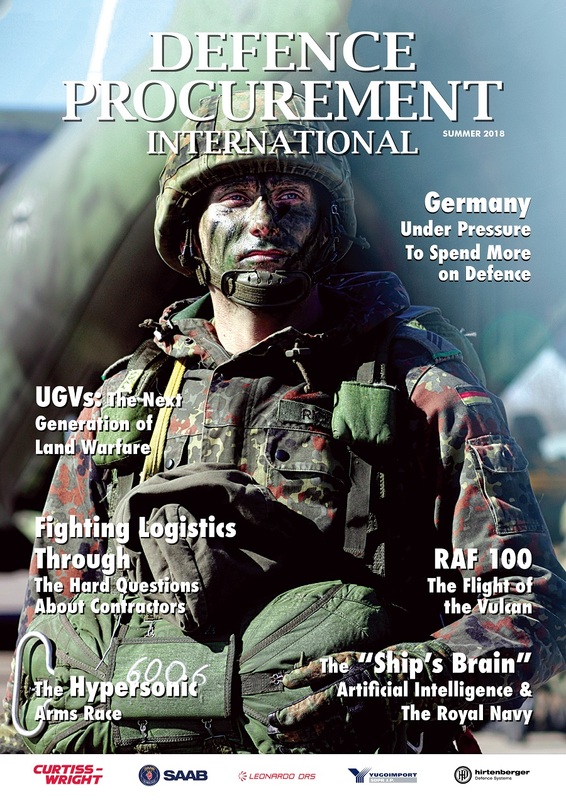 Welcome to the Summer 2018 edition of Defence Procurement International. We’re back in Paris again for Eurosatory, Europe’s leading defence and security exhibition. It comes at a time when global military spending remains high, despite the prospect of an entente cordiale between North Korea and the United States. Nothing, however, can be taken for granted when it comes to security on the Korean peninsula. Our cover for this issue reflects the ongoing debate within Europe around military spending. Whilst Russian defence expenditure is on the decline, according to the latest data from the Stockholm International Peace Research Institute, in Western and Eastern Europe the annexation of Crimea by Russia in 2014 is being used to justify increases in defence spending. In 2017, defence spending in both regions increased by 12% and 1.7%, respectively. According to SIPRI, in 2017, total military spending by all NATO members reached $900 billion, which accounted for 52% of global expenditure. Russia is also the reason why a number of NATO member countries — the US, the UK and the Netherlands, to name but a few — are trialling Active Protection Systems on armoured vehicles. Having displayed its latest Armata T-14 tank in a Victory Day parade in 2015 replete with a new APS that could potentially defeat most NATO countries’ anti-tank guided missiles, Western countries quickly realised what a confrontation with one of these tanks would mean for its armoured divisions and their countermeasures. With President Donald Trump and his Defence Secretary James Mattis putting pressure on European countries to spend more on defence and share the burden of responsibility within NATO, Germany sees itself playing an enlarged role in European defence and security. The prospect of Brexit, has also propelled German defence spending into the spotlight. The German government is split as to whether it should aim for higher increases in spending than those already agreed, to reach the 2% of GDP target recommended by NATO. But that would make Germany one of the largest defence spenders in the world, which is perhaps not quite the message it wants to send politically. There have been widespread media reports about the lack of readiness of German forces, shortages of spare parts and equipment. All at a time when the threat perception has changed and military capability is no longer just viewed as a deterrent, but as something that may actually be used in combat. In this issue we’ve also turned our focus to an often overlooked part of the military, “loggies” or logistics. Everyone seems to have an opinion on loggies, some good, some bad. But without them, most military operations would not be achievable and failure, rather than success, would be guaranteed. But with the rise in asymmetric and hybrid warfare, the work loggies do in “fighting logistics through,” a phrase coined during operations in Afghanistan as logistics patrols came under increasing attack, cannot be taken for granted. But with the increasing use of civilian contractors in logistics roles, the question needs to be asked, is the military at risk of losing essential skills when it comes to knowledge about equipment and its maintainability? And as readiness in general and the ability to deploy forces and equipment quickly becomes an oft-repeated mantra in the military, what can loggies learn from their commercial counterparts in terms of "just-in-time" logistics and a supply chain that is lean and not overendowed? Happy reading, and we look forward to meeting you at Eurosatory in Paris.